HITACHI Rail Europe has completed the first Class 385 EMU and delivered it to ScotRail at Craigentinny for commissioning and crew training. Set No. 385103 was inspected after a factory visit to Newton Aycliffe by Scotland’s Transport Minister Humza Yousaf, who also sampled a short ride on the four-car set. 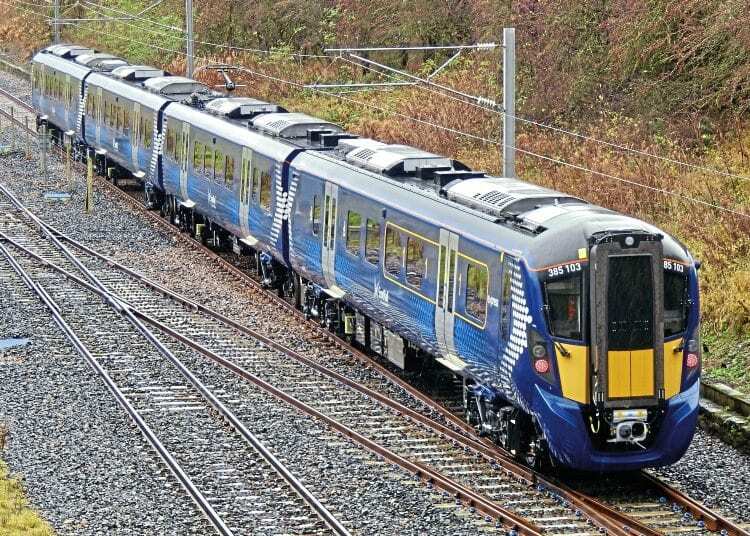 Hitachi is building 24 four- and 46 three-car sets, based on the AT200 platform, which will be used on Edinburgh to Glasgow services (all routes) as well as to Stirling and North Berwick. The set is the first to be fully fitted out internally (see p98), as two sets (385001/102) are being used for pre-production and route tests in Scotland, while a third set – 385002 – is at the Velim test track in the Czech Republic. will begin service from late-February/early March.